Want to show off those pictures of yours in a cool way? Sure you do. I found these really nice LED, cool white modules from adafruit.com. I love photos, so one thing lead to another, and after researching to see if there were rings that showcased photos,using LED, I couldn't find any, just the key chains with the digital pictures, but no finger ring. The display is bright and clear and once the image is sized to fit and printed on the transparency, this was a perfect match. Who doesn't like a light up ring and one that looks good on and off? This is my prototype that I want to share with you. The picture is my lovely Granddaughter Kylee Bug, I will be making a mold of the frame and casting them, they will make cute gifts. You could layer images, advertise, show your art photos,or just show off the people you love. I'm working on a new one and making it look like a marquee. These would look very cool all around the house etc. Clear plastic( .020") If you have leftover material to use ,you can redesign to make it work. styrene strip ( .040 x .080) x 2"
styrene strip ( .040 x .156 ) x 4" Just keep in mind, you may want extra material. finger ring blank (sold at craft store for jewelry making) or use a ring you may have. Step 2: Building the Frame. First cut the back piece out of the white polystyrene (.030") it should be 1 9/32" x 63/64" and then cut a piece out of (.020") clear the same size. (2) Side strips cut from styrene strip (.040 x .156) x 1.25"
(2) End piece cut from styrene strip (.040 x .156) x .980"
(1) Piece for top of image slide cut from styrene strip (.040 x .080) x .980"
Use plastic solvent based glue to weld the frame together, glue the bottom strip on first, and then glue the sides. At this point you should have 3 sides and a back. You can sand if you like, but I wait till I have the front and top edge on. Step 3: Cutting Down the LED Module. Remember the led tip, will set down inside the frame so it will be hidden. The actual image, area needs to be (.960" x .893") we will talk about printing the image later. There is a front and a back to these modules; the front will have a thin protective clear cover, remove that. The next thing is to carefully pull of the top light, defusing material (save this, it will be cut and one piece put back, on the section with LED, and the other will become our image slider). There is a tiny piece of dbl stick tape, use it to stick on the bottom edge of the new module. Look at the picture you will see the (.960 measurement is from just below the led inlet) this is where the cut will be. The plastic knife worked well for me, after scoring, use the craft knife to cut the foil sides, the mosaic tile nippers snap the acrylic right at the mark, then use craft knife to cut through back layer. Sand the edge lightly, wipe clean. Remove the foil tape off of the salvage piece, this is used to finish off your bottom edge of the new module, place across the bottom and a little up each side, rub it on well . New custom shaped LED module should slide right inside of your frame perfectly. Save the leftover piece of acrylic, for future projects, it has a special dot printing, which deflects light. Step 4: Soldering on the Wires, Gluing the Clear Face.and Top End Piece. Cut the LED leads off, leaving little nubs, solder on the (2) wires, note which is the positive and negative sides. Don't over heat the LED, be quick, and be sure to get a good connection. Please if this is your first attempt of soldering, don’t worry you will do fine, its not like working on electronic boards, practice first soldering the wire to your leads you cut off. Just a little note: I use a very small soldering Iron, it is only 12w,it's by far one of my best buys, I have small hands and well its like holding a pen and when I solder 0402 nano SMDs its great. Now that that is done take a small piece of dbl stick tape and apply to the back of the module, place it in to the frame, take the soldering iron tip and burn out 2 little notches on the back top edge, like picture, this is where the wires will go. 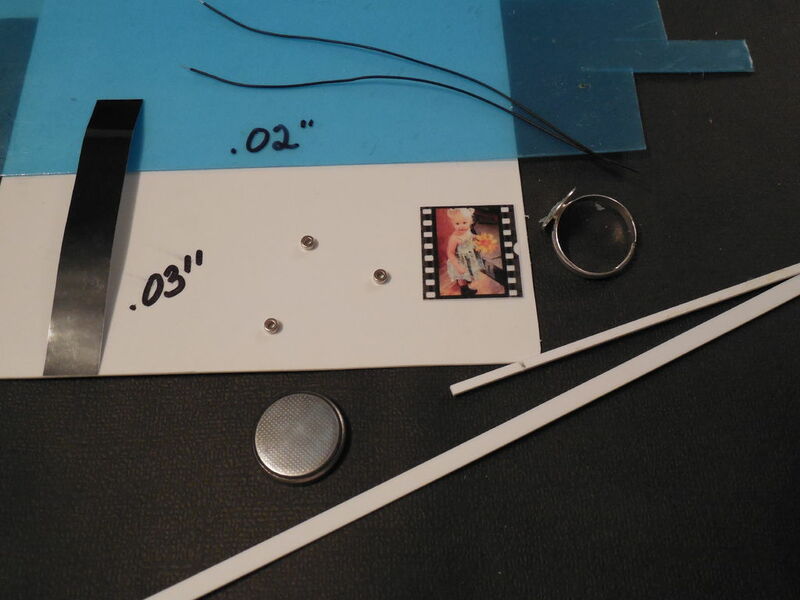 Now with a little glue on the face edges, glue on the clear piece, next glue on the styrene strip (.040 x .156) x .980" This piece is glued only to the white styrene frame not to the clear, see picture, this gap is where the picture slide will go. You may want to use a cell battery holder, I had jewelry magnets, and so I used those instead. When I make these as gifts, I will use the holder, they will be much cleaner, not to mention magnets tend to collect things. You will need to mark the back to center the battery, this is were the extra styrene strip (.040 x .156) x .980" is used, cut 2 little tabs the same height of the battery, glue one on both sides, like picture, next cut a strip to go across the top of battery. With the battery place in the center, I glued a magnet to the bottom edge, this is so the magnet will help hold, battery in its place and it is the contact point for the positive wire. Bring the wires down beside the battery, cut them off just at the end, and solder a magnet on to the end of each wire. Note: I place may magnets on a small piece of metal, this holds them while I solder on the wire. Carefully solder the positive magnet w/wire to the magnet you glued to the end. Slide in the battery with negative side up so it touches the positive magnet, put the negative magnet on to the - surface, the LED should light. Step 6: Glue on the Ring Blank. Simple, just glue on the ring blank to the styrene strip, that is just above the battery. Use E6000 or super glue. This would be really cool if it were 3D printed, so the battery holder, ring, and frame where one piece. Step 7: Creating the Image Slider. We will use the piece of defusing material that was left over. The length of this piece is the same as the back piece, mark and cut, now glue the small strip of styrene (.040 x .080) x .980" to one edge. Use the wider side to glue down and center it to defusing material. This slide is what helps change out your pictures. I have made one out of transparency film as well, the reason for this is that when you use the defusing film it darkens the light from the LED because there are 2 layers of film, with the clear one cut the same size and the plastic strip at the top, it lets more light pass through making a brighter picture. I prefer to have both, you decide. If slide comes out really easy when you move your hand around, glue a little sliver of styrene on the back, to edge of the slide so that it is, tighter in the space. Mine is fine but there could be a difference. Step 8: Sizing and Printing the Transparency and Adding Black Tape. First when you are choosing your image make sure it is rich in color, black and whites are good as well. Take your images and do several at a time if you can, to fill up your 8 1/2" x 11" transparency. I have mine printed at Staples but you can print at home just get the right material for your printer. When you prepare your images if you can save it as a jpeg and black with cmyk for printing sets, that gives better saturation. I am no pro when it comes to Photoshop, etc. but there are lots of people who can help online. The image in my picture looks a little grainy because of my zooming in,it looks very nice in person. The image is (.960" x .893"), add a header that is clear, this makes the total image to be cut (1.200") x .893" you can see in the picture. The image will lie on the slider just under the plastic strip; you then slide it into the open slot on the ring. Place the little piece of black tape on the face of the clear, just to cover the area that has no image. You can add text if using a label machine. OK so everything should be finished and if you are making this right now,bet it looks nice and please send pictures. Step 9: Your OOAK Back-light Image Ring. Well now you have it. Hope you can take, these LED backlit modules and not only create yourself a ring, but some other out of this world thing. I will be entering this in the Ring contest, if you like this Instructable and you vote for me, let me just say how cool that is and Thanks so much.